Get up to a 99% match when importing your bank statement using RecXpress. Now further enhanced to 'remember' monthly entries, RecXpress will generate a variety a variety of repetitive entries for you. Customize these entries each month until such until such time almost all entries are automatically generated by RecXpress. 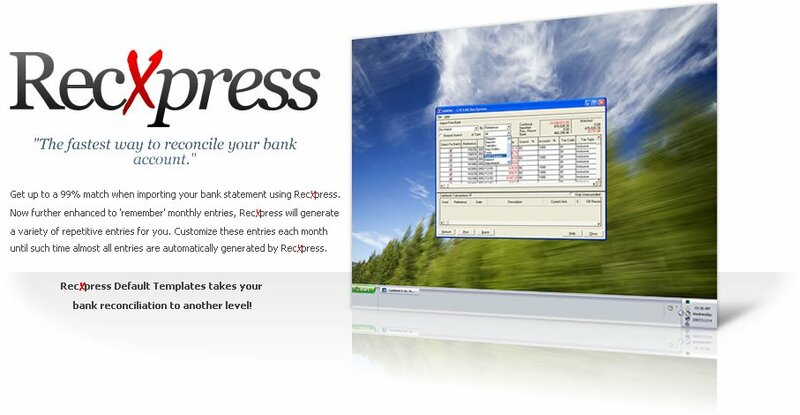 RecXpress Default Templates takes your bank reconciliation to another level! Get predefined formats for most major banks in your country. Check out the latest list of bank imports available. This list is increasing all the time as more and more banks take advantage of this new feature and make their interface formats available to Peresoft. What you need to do to get your bank statement included on the list of formats available for RecXpress. You can import your own format into RecXpress or you can choose from over 100 predefined formats already available. Templates can be created from predefined transaction codes. Create multiple entries by using Cashbook's Distribution Sets. Entries like Salary information, RAs, Staff Medical Aids, etc. can be split into multiple details from on Bank entry. You can create unlimited categories. Each category can contain similar transaction types, e.g BANKCHARGES, FOREX, etc. Renumbering sequences can be set up by category or by each entry within the category. While you set up your categories you can copy and move the entries between the different categories easily using Category Maintenance. All - all entries imported. Correctly Matched - entries where the reference number and amount of the imported bank statement entry was matched to a Cashbook entry. Matched with Error - entries where the reference number was matched to a Cashbook reference number but the amount is different. Matched Amount - the reference number was not matched but the amount of the two entries are the same. More than One Amount - matched multiple entries with the same amount. Previously Reconciled - the entry was previously reconciled. No Match - neither the reference number or the amount are matched. Many CB To One Bank Entry - more than one Cashbook entry is matched to one bank statement entry. Many Bank To One CB Entry - more than one imported bank statement entry is matched to one Cashbook entry. Display only the transactions you want to see by selecting the category of transaction codes to display, e.g. cheques, deposits, charges, etc. When importing Bank Statements, certain transaction types (Bank Charges, Deposits) often have the same reference numbers. RecXpress will generate a sequence of unique reference numbers for different transaction types, saving you the time of editing duplicate reference numbers manually. RecXpress does not only take care of matched transactions, but also unmatched transactions through a Batch Generation Feature. Your unmatched entries can be sorted by the default transaction code category, e.g. bank charges, interest, forex, etc. and separate batches can then be generated. If the entry default information is not automatically assigned to the entry by the Default Code you can enter the fields required for batch generation. RecXpress can also generate a batch from the variance amounts when selecting to display 'Matched with Error'. Post all batches generated by RecXpress to complete the matching process. Post the RecXpress reconciliation to reconcile all the posted and matched entries completes the process to match the balances correctly in Cashbook with your bank statement. RecXpress allows you to keep all the unmatched entries and lets you import your next Bank Statement to continue matching using unmatched entries brought forward. What has always taken the longest period of time to perform? The Cashbook reconciliation, although extremely versatile, it can still take many hours to balance. By enhancing the import reconciliation function already in Cashbook, an automatic match of up to 99% can be obtained using RecXpress. This process has been further improved by giving you the ability to 'remember' monthly entries and generating a variety of repetitive entries you need not re-enter each month. Customize your default template each month you do your reconciliation until such time almost all entries are automatically generated by RecXpress. RecXpress Default Templates takes your bank reconciliation to another level.